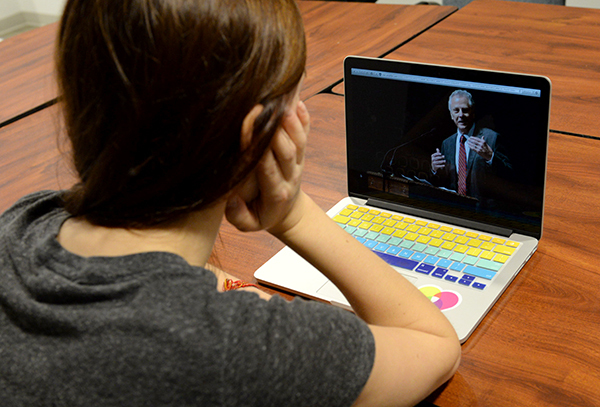 The University has nearly 20 new online programs either in the works or in early idea phases. Within the year, GW could launch five new online programs in topics ranging from health care administration to police safety and security. GW’s off-campus graduate enrollment has grown by a net of more than 1,000 students in the last five years, padding total enrollment as distance learning becomes more popular nationwide. The growth has helped put GW’s total enrollment above where it was in 2010, though total graduate enrollment slightly decreased again this year. Officials have highlighted expansion in online education as a way to offset declining graduate enrollment in many schools, but for growth to continue, more faculty will need to digitize their courses and GW will need to advertise beyond its current reach. Off-campus graduate enrollment increased by a net of 265 students this year, a big jump after just 22 more off-campus students signed up for GW programs in 2013, according to data from the Office of Institutional Research. Still, those increases have slowed since 2011, when the University added an additional 535 off-campus students. Since launching an in-house online course design shop this fall, all 10 of GW’s schools have been in talks with Paul Schiff Berman, the vice provost for online education and academic innovation, and his office, he said. His office has nearly 20 new online programs either in the works or in early idea stages, he said in an email. Within a year, the University could launch five new online programs on subjects like health care administration, police safety and security, and the law and business of federal contracting. Isabel Allen, the co-director of the Babson Survey Research group, whose report about the last year in online learning nationwide was released Thursday, said creating online courses can be pricy, though, and it can cost more to offer a traditional course online. Allen said growth in online programs has slowed since the concept was first introduced at the turn of the century. Still, online education is becoming more important to universities as 70.8 percent of academic leaders report that online programs are critical to their institutions’ long-term plans. And introducing new programs in traditional areas can be challenging for schools, since other institutions could already be known for those programs, she said. Instead, schools should look to create programs that will stand out among competition. GW has seen the largest growth in online enrollment in the School of Nursing and the Milken Institute School of Public Health. Most nursing programs are offered online, and the public health school launched its second online public health degree program this fall. Both schools have worked with third-party companies to create and market their online graduate programs, but Berman said in the fall that the in-house shop would allow programs to move online without incurring the costs of contracting. Adam Newman, a managing partner at Tyton Partners who studies online education, said although online programs are often marketed as having the potential to reach students across the globe, most online students enroll in schools near them because of name recognition. Still, GW’s national reputation could help attract students from farther away. As more schools create online programs on more subjects, it’s important for them to have solid reasoning behind making each one, he added. Off-campus enrollment in the nursing school has nearly doubled in the last five years, and the public health school’s off-campus enrollment has increased 13-fold in the same time. But off-campus enrollment in the School of Business, which offers online MBA and executive education programs, has fluctuated. Off-campus enrollment peaked last year – the same year former dean Doug Guthrie overspent by $13 million, partly on online programs – but saw a total loss of nearly 100 students this year. The College of Professional Studies, which offers nine online programs and three hybrid degrees, has increased its online enrollment about 27 percent in five years, enrolling 635 off-campus students this year. That’s an increase of 74 students from 2013, when the school saw a slight drop in off-campus enrollment. Matt Hamill, senior vice president at the National Association of College and University Business Officers, said universities across the country are experimenting with how to use technology to teach more students and teach them in different ways.